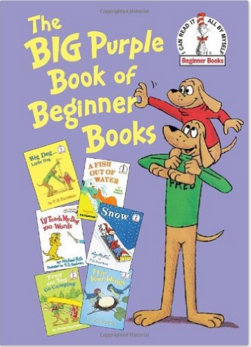 The Big Purple Book Of Beginner Books Just $10.17 Down From $16! You are here: Home / Great Deals / Amazon Deals / The Big Purple Book Of Beginner Books Just $10.17 Down From $16! Check out this great deal on Amazon! The Big Purple Book Of Beginner Books contains 6 books for just $10.17 down from $16! That’s just $1.70 for each book! Get yours now while it lasts! Calling all P. D. Eastman fans! What could be a better than six Beginner Books written and/or illustrated by P. D.—or son Peter—Eastman? Six of them for less than the price of two! At only $15.99, The Big Purple Book of Beginner Books is an incredible value and includes the full, unabridged text and illustrations for A Fish Out of Water by Helen Palmer, I’ll Teach My Dog 100 Words by Michael Frith,Fred and Ted Go Camping by Peter Eastman, Snow by P. D. Eastman and Roy McKie, and Flap Your Wings and Big Dog . . . Little Dog by P. D. Eastman, all bound together in one sturdy, hardcover omnibus. Perfect for birthdays and holidays, this is a classic, affordable gift the whole family can enjoy together.